Farming goat is one of the branch from animal husbandry. Goats are usually raised for their milk, meat, fur, and skin. Basically every part of them can be useful for human, so you may want to consider farming goat for your future business. You have to understand the basic guide for goat farming to start your own farm. After that, knowing the common diseases in goat farming will help you to prevent your goat from sickness and be prepared to overcome those diseases when they strike on your goat. This knowledge is also helpful for you to avoid buying a diseased goat. In general, make sure to separate the sick goat from the rest of the herd if a disease is contagious. You may want to have a pen or two for sick animal quarantine. It is a good idea stocked medications, like antibiotic ointments for pink eye and CD antitoxin for enterotoxemia, in your farm medicine cabinet; ready to go as soon as you see the symptoms. If the goat’s stomach containing a lot of gas caused by a fermentation process that runs fast and cannot release it in the form of farting, its stomach will be bloating. This disease might sounds silly, but the high accumulation of gas in the stomach will suppresses other organs in the body and causes pain. If that happens, goats will breath with their mouths open due to the high frequency of breathing. When your goat is bloating, it becomes distressed, stamps its feet, bleats, urinate frequently, and walk with stilted action. Goat feed should be made by the combination of dry pasture with leaves of legumes. Make sure to use dry hay or dry pasture only to prevent bloat. Avoid bloat with peanut oil sprinkled on your goat feed. Mostly caused by irritation from being pierced by things, such as woods and thorns. And like human, it can also happens because of bacteria, viruses, or parasites. The symptoms are redness, blinking and tearing of the eyes. If not handled properly, it can get worse and cause permanent blindness. The same rules as humans also apply; keep the sick goat away from the rest of the herd, wash your hands thoroughly after handling a goat with pink eye, and treat it. You can treat pink eye by applying a special goat’s eye ointment containing antibiotics to relieve the infection quickly. You can also spray stale tea mixture, betel leaf and salt every day until it healed. Enterotoxemia is one of the most common disease in goat farming that is caused by a bacterial imbalance in the goat’s rumen. Sudden feed changes, sickness, overfeeding, or anything that causes a digestive upset are the main reason of it. Enterotoxemia can kill your goat, so don’t forget to vaccinate your herd against this and have the treatment—CD antitoxin— on hand just in case. The symptoms are including severe pain and swelling in the abdominal region, excitement, and fever. Prevent enterotoxemia by vaccinating 3 months kids (young goat), and repeat that again after 14 days. Annual vaccination also required. Orf is a contagious viral infection where blisters form in the goats’ mouth and nose. This is one of the common disease in goat farming that can be passed to humans. Orf heals in a few weeks or so as the disease runs its course. However, the scabs from the blisters around the mouth can be contagious for years. Sometimes, the blister also spreads to the nail and infect the udder of the mother goat. You may want to separate infected goat to slow down cross-transmission to herds. Don’t forget to wear disposable gloves to prevent cross infection and self-infection. Contact your trusted vet if there is a risk of misdiagnosis with other, more serious conditions. CAE is caused by a virus. It harms goats’ immune systems, incurable, contagious, and devastating to goat herds. This common diseases is similar to the human AIDS virus, due to being from the same familiy of viruses, but CAE cannot be passed to human. CAE can be transmitted to kids through mother’s goat milk; it is important to know that the pregnant mother doesn’t have the disease. Make sure that you inspect records and know that you’re purchasing CAE-free goats as CAE can be tested for. This is a chronic, contagious disease that is also called a yolk boils and “abscesses”. Pus-filled infections, or abscesses, form around goats’ lymph nodes that is caused by the bacterium coryne and bacterium pseudotuberculosis. When the abscesses burst, CL can infect other goats. 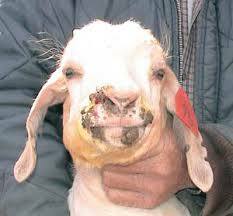 As the head part of the goat is most commonly affected, so the most likely point of entry of this infection is through abrasions on the head or in the mouth. You should purchase CL-free goats because this disease has no cure, yet. Coccidiosis is a parasitic disease caused by coccicidian protozo. This disease transmitted from one animal to another by contact with infected feces or ingestion of infected tissue. Most goats infected with coccidiosis with no symptoms, but young kids are more susceptible to getting diarrhea (sometimes bloody) from it, as well as rough coats and general ill health. The most common medications used to treat coccidian infections in farming goat is Albion. Some farmers also feed a coccidiostat as a preventative. Depending the condition of your goat, untreated coccidiosis may clear of its own accord, or become severe and damaging, and sometimes cause death.